Major floods in 1996-1997 on the Yellowstone River intensified public debate over the effects of human activities on the Yellowstone River. The Yellowstone River Conservation District Council partnered with the U.S. Army Corps of Engineers to conduct a cumulative-effects study on the Yellowstone. 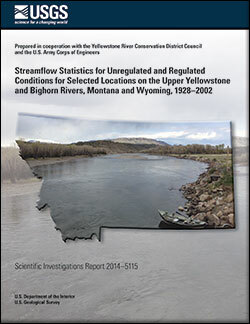 For that study, the USGS calculated streamflow statistics for unregulated (no development) and regulated (with development) conditions for the Yellowstone River and tributaries. 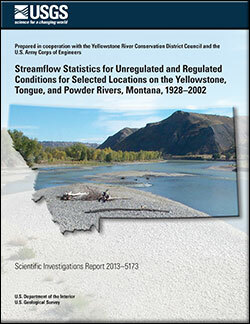 Streamflow statistics for unregulated and regulated conditions for selected locations on the Upper Yellowstone and Bighorn Rivers, Montana and Wyoming, 1928-2002; 2014; SIR; 2014-5115; Chase, Katherine J.
Streamflow statistics for unregulated and regulated conditions for selected locations on the Yellowstone, Tongue, and Powder Rivers, Montana, 1928-2002; 2013; SIR; 2013-5173; Chase, Katherine J.